In a remarkable combination of innovative journalism, corporate branding and GPS technology, the venerable British Broadcasting Corporation has embarked on a unique voyage of discovery that will see a BBC-branded, GPS-equipped standard shipping container quietly go about its business for a year, all the while beaming its coordinates back to the Beeb where its journey around the world will be tracked. Members of the public can follow its journey on a special BBC web page. As of my writing this post, the container was just west of our Glasgow-based colleague, Danny Sullivan, where it was picking up its first cargo of — what else! — Scotch whisky. From there, it will go to the huge seaport of Southampton in southern England and from there to Asia. 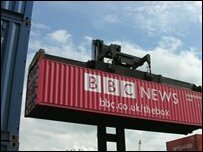 The BBC is hopeful the container will visit every corner of the globe, and that it will not wash overboard. Its correspondents will use the container as a continuing thread to pull together a series of stories that illustrate how goods are manufactured and shipped around the world and the lives of the people involved in doing so. I was immediately attracted to this story. I have long had a fascination with TEUs, short for 20-foot-equivalent units, the proper name for the ubiquitous intermodal container that has revolutionized the global cargo industry, and the massive vessels that carry them from port to port. One of the more memorable events I covered as a journalist in Halifax was the arrival of the first so-called 3G, for third-generation, container ship to visit that port. The night before, another reporter and I had been guests at a schnapps-fuelled reception thrown by a Swedish trade mission and then, on very few hours sleep and far too much aquavit, we caught a 6 a.m. harbour tug that was to meet the goliath of a vessel off Chebucto Head at the entrance to Halifax Harbour. There have been few hangovers as memorable as the one that visited me as I fought for my sea legs on the aft deck of a diesel-driven tug boat out on the freezing cold and choppy waters of Halifax Harbour, all the while focusing a long telephoto lens on the coastline, the other harbour traffic and, of course, the huge ship we towed into Fairview Container Pier. What I wouldn’t do for a good story and a great picture when I was young and foolish!